Harry Potter: Hogwarts Mystery Gameplay Trailer Debuts | Nerd Much? Jam City appears to finally be ready to showcase some of what’s in-store for us within Harry Potter: Hogwarts Mystery. The upcoming mobile title is now accepting pre-registrations through Google Play and showcased its first gameplay centric trailer. Your customized character appears to have the full Hogwarts experience ahead of them within the game. The trailer begins with an owl dropping you your invitation to Hogwarts School of Witchcraft and Wizardry. We then cut to The Great Hall where you’re tasked with choosing your House for the duration of the game. While the Sorting Hat is present, you’ll actually choose your House for yourself. Gryffindor is described as brave and daring. Hufflepuff as dedicated and loyal. Ravenclaw recruits are intelligent and witty while Slytherin are ambitious and cunning. The primary school staff from the books appears to be in tow as well. You’ll interact with Professor McGonagall, Professor Sprout, Professor Flitwick, Professor Snape and Professor Dumbledore. 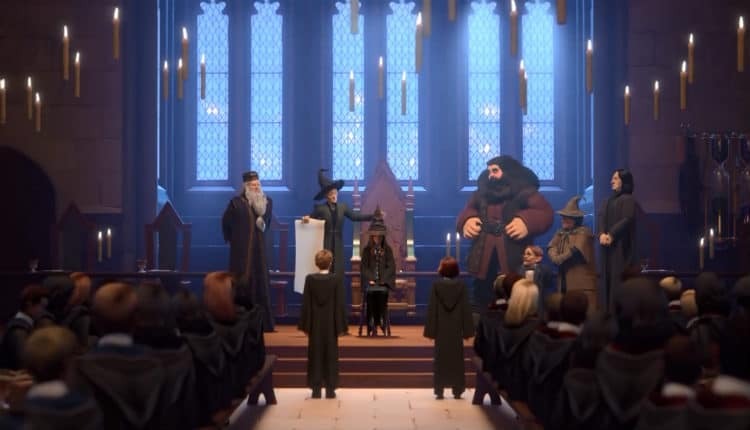 Hagrid is prominent in the trailer as well. Jam City describes the game as a narrative adventure with RPG elements. You’ll create your character, go to class, learn magical abilities, and form friendships and rivalries. Looking at the trailer, it appears to feature some turn based RPG action. However, it also looks like it sports “energy” meters of sorts determining how long you can play the game before requiring a premium purchase. The mobile title is scheduled to launch sometime later this year. Fans on Android devices can pre-register and be notified when the game goes live. It will be downloadable eventually via both the App Store and Google Play.